It’s time to get involved ladies! This is the second International Female Kite Week where women in kiting all around the world get together to celebrate and honor women in kiteboarding. 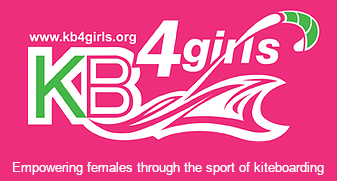 This is a non-competitive week where events are being held globally – check out the KB4 Girls Chapters below to see what’s going on near you! So whether it’s a get together at a nice warm, sunny, windy beach or a snow covered mountain, in a bar or just you and your best kiting buddy at home with a kiting dvd, raise a glass or a mug of tea and celebrate your awesomeness! Oh and don’t forget to join the raffle for some truly amazing prizes! Happy kiting ladies and just remember, you rock! and win a super cute Baby-G watch! For further info on how to hold your own event and how to get a chance to win click here!!! Unless you have been hiding out at your secret spot, you will have heard about the King of The Air competition. Of course it is a spectacle to watch but what might interest you are the videos for the wildcard entries. Often you will see some very nice moves and in the case, Damien Girardin is showing what a low kiteloop looks like.